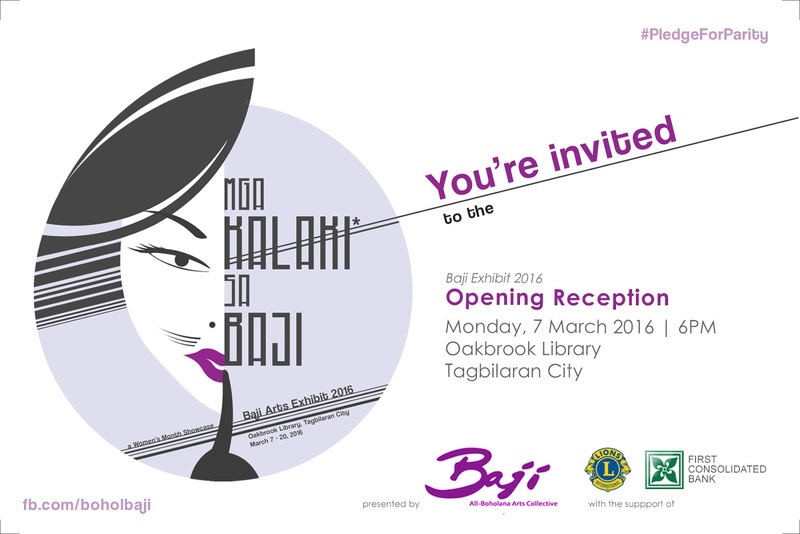 The Baji Arts Collective once again celebrates womanhood with the annual Women’s Month showcase Baji Arts Exhibit that is set to open on Monday, March 7, 2016, 6:00PM at the Oakbrook Library and shall open until March 20, 2016. The exhibit is headlined “Mga Kalaki sa Baji” where the all-Boholana literary and visual artists shall feature works that play on the word “kaláki” which either means antics or stunts; ability or potentiality; or, if drawn from rootword “láki”, maleness – but conscious and cognizant that it is a gendered expression, unfair to both men and women, and that which must be challenged. The Baji Collective, in claiming the expression to banner a showcase of Boholana prowess in the visual and literary arts, hopes to open healthy discussions on the nuanced historical and contemporary meanings of their exhibit theme and at the same time, subscribing to the year 2016 International Women’s Day campaign theme: Pledge for Parity. The International Women’s Day theme calls for gender-balanced leadership, respect and value difference, develop more inclusive and flexible cultures or root out workplace bias, each of us can be a leader within our own spheres of influence and commit to take pragmatic action to accelerate gender parity. The Baji Exhibit is presented by the Baji Arts Collective with the support of the Tagbilaran City Host Lions Club, the First Consolidated Bank, NT & J Shirtdesigns and J. Flores Dental Clinic. The Oakbrook Library opens Monday to Saturday from 9AM to 7PM.